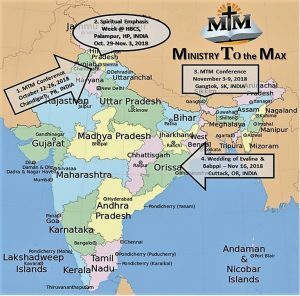 This MTM ministry trip was marked by four major ministry events all in one trip to India. This included three different leadership conferences in three totally different regions of India. All this was followed by the Burkholder’s officiating in a wedding in yet another region of India. This trip also included hosting three different MTM teaching teams from different parts of the world. After 10 different air flights and one month in India truly this was MTM-Ministry To the MAX. Hallelujah! Jamasiki! (Praise the Lord!) The services began with vibrant worship that had a beautiful Indian twist to it. In October 2018, Debbie and I took the opportunity to join Raymond Burkholder and his wife, Naomi, at Chandigarh, India for a 5-day Leadership Conference. More than half of the 40 to 45 attendees were youth. Raymond challenged them to “Know the Lord, and Make Him Known, and I spoke on “Shepherd Leadership.” We had one evening revival service which ended up being mostly youth. The place was packed, with standing room only. There was an amazing response as the Spirit of God brought many to salvation (approximately 13 first time commitments) as well as many rededications to a deeper walk with God. Allen Yoder praying over the attendees!! The last day of the conference, we prayed over many individuals who were willing to be sent forth in the name of Jesus and commit themselves sacrificially to the furtherance of the Kingdom. Pray that they can be faithful to their commitments and bring change to the world in which they live. “Thy Kingdom come, Thy will be done on earth as it is in heaven.” This world should become a better place because we’ve been here under the influence of the Holy Spirit. That’s why we were born and this is what MTM is all about. Editor’s Note; The above testimony was written by Allen & Debbie Yoder from Berlin, Ohio. They have served the Lord on the domestic and foreign fields and presently are serving as pastor of a small congregation in Ohio. May the Lord reward you openly for your labor of love in serving Him as well as the delegates who attended the Chandigarh conference. Thank you & God bless you. Nestled on a hillside in northwestern India, with the Himalayan mountains in the background, lies Berachah Bible College (HBCS). 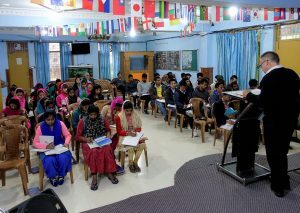 Under the direction of Dr. Sam Abraham, the group of approximately 60 students here have been given the opportunity to receive sound, biblical teaching in a well-disciplined Christ centered environment. MTM annually serves this Bible college as an extension teaching program. Gaylord Barkman teaching on the Life of Jesus Christ. I & Josh Slabaugh had the opportunity and privilege to join MTM for their 2018 Spiritual Emphasis Week at HBCS in the month of October. The students received the Word with eager and open hearts. 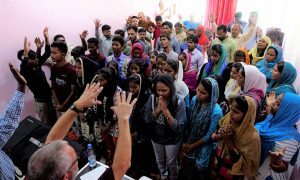 I have been deeply impacted by this Godly group of young Indian men and women who are preparing to take the good news of Jesus in their home communities and beyond. The students come from various states throughout India for a 3-year program. 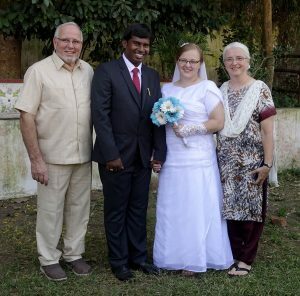 Their life experiences vary but one thing they each have in common is living in a culture heavily influenced by Hinduism. This religion holds to the belief that there are 330 million gods, and Hindus live in constant fear of the spirits. While small number of them are from Christian homes, the majority are first generation believers whose families are Hindu. Some had been deeply affected by the dark evil powers but are now set free and experiencing the life-changing freedom that Jesus Christ brings. I asked several students what their plans are after graduation. Without hesitating, each replied that they want to do ministry in their home area when they return. Pray with me, that as these dear young people grow in their knowledge of God’s Word, their faith will also increase! May God’s kingdom grow and advance as these “lights” are dispersed among the dark land of India! I am grateful to MTM and Raymond Burkholder for giving Josh & I the opportunity to join them in this special experience in making disciples of all Nations. Editor’s Note; The above testimony was written by Gaylord Barkman & Josh Slabaugh. Gaylord Barkman is originally from Holmes county, Ohio, but is presently serving in the pastoral role of the IGo Bible Institute in Chiang Mai, Thailand. Josh Slabaugh is originally from New Holland, Pa, and is presently serving MTM as the Internet Technology technician. A very special thank you to both of you dear brothers for serving the Lord through MTM. Your labor of love was much appreciated. Gangtok, India is located in the foothills of the Himalayas, one of the most beautiful areas in the world! I felt very blessed to have the opportunity to join Raymond and Naomi Burkholder and MTM for a four-day conference in this picturesque city. The topic of the week was “Leadership Priorities”. Approximately 80 dear souls gathered from day to day, drinking in the truths that were taught from God’s Word. As it turned out, most of them were emerging leaders rather than pastors but nevertheless there was still a great desire to learn from God’s Word. As the week went on, we got deeper and deeper into the Word. The city of Gangtok was preparing for “Diwali”, or “Festival of Lights”. This is a Hindu festival, and it is celebrated annually. It is one of the most popular festivals of Hinduism, and it symbolizes the spiritual “victory of light over darkness, good over evil, and knowledge over ignorance.” Lights were being put up in the city, and at night it was beautiful! A bit of humor was realized when our auditorium was darkened as the power went out right before one of our sessions was to start. Of course, this made the projector unusable, so we improvised (necessary in India!). It was a blessing to be able to share about the true Light, realized through our Lord Jesus Christ alone. The conference was conducted Monday through Thursday. Very early Friday morning, we left our hotel at 4:30 AM to drive up the mountain to a lookout. We wanted to see Mount Kangchenjunga as the morning sun hit it. At 28,169’, it is the 3rd highest peak in the world at only 866 feet less than Mount Everest. Mount Kanchanjunga at 5:00 AM with the morning sun’s glory upon it. It lies on the border with India and Nepal. We were blessed with little to no haze, which is often present. We had a beautiful view of the mountain and took many photos. It was another affirmation of the marvelous creation of our Lord, and as the morning sun rose and lit up the mountain peaks, we were again reminded of the true Light. We serve an awesome God! Brother Markus was a wonderful host and organizer. We deeply appreciate his hard work in pulling this conference together. May the Lord bless him and his family as they serve Him in north India! Editor’s Note; The preceding testimony was written by Tom Graber. Tom & his family are from Ephrata, Pa and Tom serves as a deacon at the Pleasant Valley Mennonite church in the Ephrata community of PA. Tom will be moving his family to Ghana, Africa, for a term of missionary service with PALM ministries in the very near future. Thank you brother Tom for your sacrifice and labor of love unto the Lord. What an honor and privilege to be an invited wedding guest to officiate in this very special marriage ceremony of Ambram Ganta (better known as Bappi) and Evalina Bergen. In many ways you really have not been to a wedding until you have been to an Indian Christian wedding. The joy, excitement, food, selfies and celebration are way over the top indeed. Perhaps it is a foretaste of the marriage supper of the Lamb…I really am not sure. But Naomi & I counted it a great joy & privilege to be special invited wedding guests to this unique cross-cultural marriage ceremony. CONGRATULATIONS TO THE NEW COUPLE!! Along with Raymond & Naomi Burkholder. CLICK HERE TO VIEW PHOTOS FROM ALL CONFERENCES AND THE WEDDING!! PLEASE COME BACK BEFORE THE DOOR CLOSES!! The Staggering Needs of Maharashtra State of India! !